This Labor Day weekend Oregon's workers labor in a state that is creating more payday loan shops than McDonald's restaurants and producing more bankruptcy filings than college degrees, according to a report issued today by the Oregon Center for Public Policy. The Oregon Center for Public Policy uses research and analysis to advance policies and practices that improve the economic and social opportunities of low- and moderate-income Oregonians, the majority of Oregonians. Bound reports available for $15, including postage. Download the order form. "It’s now been 44 months - more than three and a half years - since Oregon’s jobs downturn began," Michael Leachman, policy analyst at the Oregon Center for Public Policy said, "and still jobs have not recovered to their pre-recession levels. That makes the recent jobs downturn more than twice as long as the early 1990s recession." During the early 1990s, jobs returned to their pre-downturn peak in just 20 months. Noting that the typical household lost nearly $3,000 in the downturn and has less income than 1988-89, the public policy center's report concludes that, "Eventually, the downturn will recede into memory, but its shadows will loom over too many of Oregon's working families for years to come." 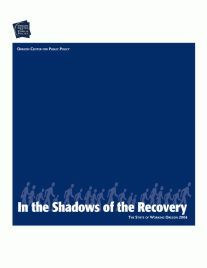 The report, In the Shadows of the Recovery: The State of Working Oregon 2004, is the first comprehensive look at the economic condition facing workers during the nascent recovery. The report documents that after the recession hit in 2001 household incomes fell sharply while crucial family costs rose, producing skyrocketing personal bankruptcies, home foreclosures, and debt to high-cost lenders. "Oregon's economic picture appears to be brightening," said Michael Leachman, the report's author, "but too many of Oregon's working families will labor in shadows cast by the economic downturn for years to come." Leachman said that Oregon's personal bankruptcy filing rate over the first half of this year was nearly four times the rate during the deep downturn of the early 1980s. Unpaid medical debt at Oregon hospitals has been rising since the downturn started and is still rising sharply this year. Noting that Oregon has more payday loan shops today than McDonald's, Leachman said "As Oregon's economy has failed to keep Oregon workers healthy, it has super-sized the payday lending industry." The report documents that during the economic downturn Oregon foreclosure rates were well above the national rate, borrowers nearly tripled the number of loans they took from payday lenders, and families nearly doubled the debt they owe to Oregon hospitals. "Shattered family finances are part of the fallout of the economic downturn," said Leachman. "Recovery for these families will be a long-term process." The income gains made by the typical household during the booming 1990s have now been eliminated, and only the wealthiest households are doing better than a generation ago, according to the report. "The richest Oregonians have done well at the expense of middle- and low-income families over the last generation," said Leachman. Compared to 1979, the real adjusted gross incomes of the richest one percent of Oregon taxpayers in 2002 were up 91 percent, while the average income of the middle fifth of taxpayers was down 3.6 percent. While the growth in income inequality "hit a speed-bump" during the downturn, the Center says it's still a problem. The Center calculated that Crook County now has the highest rate of income inequality among Oregon counties, with the richest one percent holding incomes nearly 30 times the average income of middle-income families. The report sheds light on why health care is a hot button issue this election year. Skyrocketing health care costs and cuts to the Oregon Health Plan caused a surge in the number of Oregonians without health insurance and in the amount of medical debt Oregonians were unable to pay. In addition, the report calculates that workers' cost of health care coverage rose sharply over the last decade, fewer employers are offering health coverage, and more employers are requiring a waiting period for new employees to receive access to benefits. "It is difficult celebrate being in an economic recovery with so many workers unable to pay for health care to recover from illness and injuries," said Leachman. The report notes that a variety of basic costs facing working Oregonians this Labor Day have been trending upwards, including housing costs, higher education costs, child care costs, and gasoline prices. "Oregon's working families are financially more fragile today than they were four years ago before the recession started," said Leachman. "Incomes are down, costs - especially for health care and higher education - are up, the public safety net is in tatters, and debt problems have skyrocketed." "Working families with the audacity to get sick or to send a kid to college today are more likely to struggle or even give up than they were just a few years ago," Leachman said. "Families who went bankrupt will be forced to seek higher cost credit, making it more difficult to build their assets." Compared to 1993, the value of subprime loans in Oregon has grown 99 times. At the peak of the downturn, nearly one in ten subprime mortgage loans in Oregon was in foreclosure. There are now substantially more payday lenders in Oregon (246) than McDonald's (167). The zip code with the highest concentration of payday lenders is in Gresham. Over the first year of the recession in 2001, the fees collected by pawnbrokers soared, rising 34 percent. There were more new bankruptcies filed than new college degrees awarded in Oregon in 2002. In the first half of 2004, the bankruptcy rate held at the high levels of 2001-03 and stands at nearly four times the rate during the deep recession of the early 1980s. The percentage of low-income working families losing money to high-cost, rapid tax refund loans has been rising. Warm Springs has the zip code with the highest share of low-income working families losing money to rapid refund loans. Average annual earnings for Oregon workers in 2003 were $34,442, down nearly $600 from the 2000 peak, and over $100 less than in 1976 in real terms. Just eight percent of poor families with children in Oregon received the majority of their income from cash assistance in 2002-03. About 64 percent of poor families with children worked at least one quarter of the year in 2002-03, and 27 percent worked full-time, year-round. The average annual employee contribution for family health insurance coverage in Oregon nearly doubled between 1993 and 2001, rising from $1,043 to $1,841. In Multnomah County, the share of renters paying more than half their income to rent rose from 21 percent in 1999-00 to 27 percent in 2002-03. Taxes for most Oregonians have become more affordable. Oregon households paid 6.8 percent of their income to state and local taxes in 2002, compared to 7.4 percent in 1989. Leachman said public investments are needed to address the problems documented in the report and move Oregon onto a quicker recovery. "Public investments in health care, education, a strong social safety net, job training and a focus on creating and moving Oregonians into family wage jobs can get Oregon's workers out of the shadows caused by the recession," he explained. "Oregonians can choose to take a new path where we make public investments that spread economic growth to all Oregonians. If Oregonians choose this high road, true recovery will be quicker and more equitable," he concluded. The Oregon Center for Public Policy uses research and analysis to advance policies and practices that improve the economic and social prospects of low- and moderate-income Oregonians, the majority of Oregonians. Posted in Health Care, Hunger and Food Assistance.